Pro Baseball Home Run Derby. Please do not leave us with a single ticket! An order that leaves us with a single remaining ticket will most likely be canceled. (Example: If a quantity of 4 is available, purchasing 3 tickets leaves us with a single remaining ticket). Seats are guaranteed to be consecutive (side by side) unless noted otherwise. Lease scroll down to read the full listing terms BEFORE purchasing. We Are Not Responsible For Your Failure To Read The Full Listing Description. THE SECTION VIEW IMAGE PICTURED ABOVE IS A STOCK IMAGE TAKEN FROM A RANDOM LOCATION IN EACH SECTION. 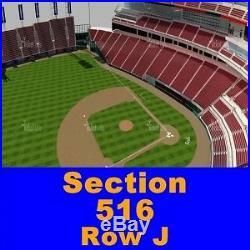 The intent of this image is to provide an approximate’point of view’ perspective to the playing field from the same section as the tickets being offered for sale in this listing. Section 3D View Powered by TicketUtils. Quantity is from 1 to 14 tickets for this event as long as you do NOT leave a single ticket remaining in our inventory. Reprints may be available under certain circumstances. We do NOT substitute tickets. You will receive the exact tickets as denoted within this listing. As we process orders from various sources e. In rare circumstances when these tickets are no longer available, a representative will contact you to offer comparable, or better, replacement tickets. Many of our tickets are in e-ticket format. This may not be specified in the listing. E-Tickets function the same as hard tickets, and will be scanned at the venue for entry. Some of our tickets have the original purchaser’s name printed on them, this does not affect your ability to use the tickets, as tickets are transferable and the original purchaser’s ID is not required for entry. All tickets are guaranteed to be valid and issued for the seating location specified on the tickets. The claim must also be complete before distribution of reimbursement can take place. Please note: We are not notified of canceled events. Original tickets will be used for the new event date. All sales are final. Seating Chart: Venue seating chart is based on the most accurate seating details which have been disclosed to the public by the ticketing agency, event venue website or event venue box office. We cannot be responsible for changes or errors in the seating layout. Floor plans vary from show to show and, things like, stage set up or sound board location can alter the seating layout. We guarantee to tell you what is printed on the tickets, including, the Section, Row and Seats # (only if the seat numbers are disclosed within the listing). As a value added service to our clients, we attempt to make a good faith, or bonafide attempt, to denote the seating location on the venue seating chart. As the venue seating is not within our direct control, we cannot be held responsible for guaranteeing the exact location of any seats. Any questions you have with the seating location should be forwarded to the event venue box office. We are not affiliated with Ticketmaster or any other ticketing company, any box office, venue, performing artist or sporting organization such as: NBA, NFL , NHL, MLB, NCAA, NASCAR, USTA, PGA, LPGA, USGA, WNBA or any other sporting organization. All logos and names of any of the aforementioned are used for purposes of factual description only. Tickets may be priced above or below the original box office cost, or face value. All Sales are final. All event dates and times are subject to change without notice. Solutions for Ticket Sellers. The item “1-14 Tickets Pro Baseball Home Run Derby 7/13 Great American Ballpark DUTCH” is in sale since Monday, July 14, 2014. This item is in the category “Tickets & Experiences\Sports Tickets”. The seller is “stubworld” and is located in Pomona,NY. This item can be shipped to United States, to Canada.